The combination of gin and dry vermouth is a natural, and it’s so well entrenched in our thinking, thanks to the Martini, that modern cocktails hardly ever pair gin with sweet vermouth. It wasn’t always that way. Take, for example, the Bijou. Bijou is one of our oldest cocktails. (The earliest mention of Bijou that I know is Harry Johnson’s 1882 Bartender’s Manual .) 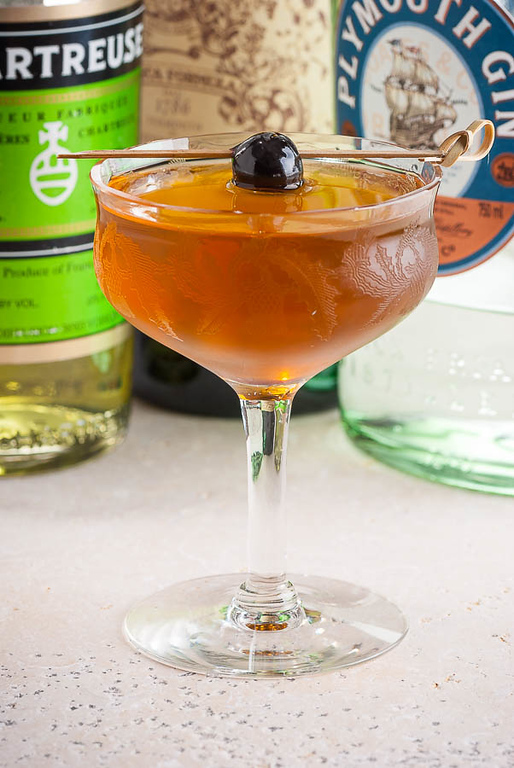 Its combination of gin, sweet vermouth, and Chartreuse is a classic mini-lesson in late nineteenth-century cocktailing. Commercial vermouth was a relatively new product to American barmen in the 1870s and 1880s, and they were eager to see what they could make of it. At the time, “vermouth” meant sweet vermouth—dry vermouth wasn’t available until the 1890s. There were plenty of successful experiments, notably the Manhattan, the Martinez, and the Bijou. Stir all ingredients with ice until very cold; strain into a chilled cocktail stem. Garnish with a cherry. Express lemon over the drink; optionally, add the lemon twist into the glass. Gin: Johnson recommends Plymouth gin in his original listing, and it is a very good choice. The Plymouth seems to blend with Chartreuse better than the more juniper-forward London Dry style gins like Bombay, Beefeater or Tanqueray. 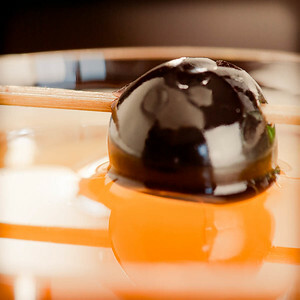 Vermouth: The Bijou is an excellent opportunity to use the vanilla-dominated Carpano Antica vermouth. Carpano’s lush sweetness makes a nice counterpart to the aggressive herbal nature of the Chartreuse. Dolin is also a fine choice—the light fruitiness of the Dolin Rouge is another way to blend well with the gin and Chartreuse. On the other hand, my standard sweet vermouth, M&R Rosso, doesn’t seem to be such a good friend of the Bijou; its more bitter earthiness leans in the wrong direction for this mix. Garnish: Johnson suggests that you garnish the Bijou with a “cherry or medium sized olive.” Against my better judgment, I tried the olive. I won’t do that again. In fact, I’m partial to just the expressed lemon oils. The combination of gin and sweet vermouth isn’t to everyone’s taste; for that matter, Chartreuse itself can be an acquired taste, so the Bijou isn’t on everyone’s favorites list. But if you like to experiment, or if you’re looking for a cocktail with bigger flavors than you’ll typically encounter, the classic Bijou is an excellent place to start. “The Bijou Cocktail” at cold-glass.com : All text and photos © 2013 Douglas M. Ford. All rights reserved. Might be my favorite drink with green Chartreuse. Well, maybe tied with the Albert Mathieu. Or the Last Word. I love Chartreuse. As an aside, where do you find your glassware? This one’s a beaut. I have never had the Albert Mathieu; I’ll look forward to trying it. Thanks for drawing my attention to it. The glass in the Bijou photo is something I found in a local antique shop. I don’t know where or when it was made, alas! What a wonderful cocktail this was. Perfect balance. We used M&R and thought it worked really great, but will try other vermouths with this to see which we like best. Glad you liked it, Chuck, thanks! I have been a bit sceptical about this one for some time, but kept coming back to look at it. I mean, green chartreuse, red vermouth? And in equal quantities? Sounded like the interior of a cheap Chinese restaurant! Finally tonight, I stepped up to it. What an unexpected pleasure! The vermouth (Dolin Rouge) totally balanced the amer of the Chartreuse, leaving a very pleasant sweet spiciness that makes this a quite delicious aperitif, somewhat in the French style. This definitely goes on my regular list. I’m glad you tried it with the Dolin, that makes a delightful combination. Glad you enjoyed it! I discovered the Bijou through your website, and it has since become one of my favorites. It feels like a magic trick, conjuring the tastiest cocktail out of three equal parts that don’t make any sense on paper. For a variation that is softer on both the palette and the wallet, try swapping out the chartreuse with Genepy Des Alpes. I agree, it is a strange-looking recipe on paper, but it works. I don’t think I’ve encountered Genepy des Alpes, I’ll put it on my list of things to learn about.